President Obama one thing clear to me and other attendees of the National Clean Energy Summit on Monday – he is ready to tap into the power of the sun. In his speech in Las Vegas, the president stressed the urgent need to implement clean energy solutions in order to cut global warming pollution and strengthen our economic future. He laid out new clean energy initiatives to increase the use of solar energy on military bases and help more home owners access low-cost rooftop solar power. What’s more, President Obama made a clear case for why every American, regardless of political party, should support the adoption of solar energy. And it’s been a big problem in states like Arizona, Colorado, Nevada, North Carolina, Wisconsin and others where fossil fuel companies have attempted to stall progress on solar energy. And because of the steps we are taking, the future of solar is bright. Solutions like using recent technological advances to tap into solar and wind energy can to solve our carbon pollution problems. These solutions are at our fingertips. But we must be bold enough to implement them. That’s exactly what we’re aiming to do. At Environment America we believe our nation should be striving for nothing short of a 100% renewable energy future. No one is saying it will be easy, but with the release of the Clean Power Plan -- the single most important step America has ever taken to combat climate change -- we’re moving in the right direction. If we can put our weight behind implementing clean energy like solar and wind, then we can make an impact on reducing the emissions causing global warming. In fact, solar is predicted to be the cheapest source of energy by 2016. We no longer have any need for the dirty fossil fuels of the past. But it won’t just happen. There are still special interests betting against us so we can no longer afford to be complacent – we have to act. We’ve already multiplied the amount of solar energy 20 times since 2008, a rise predicted by few. All of this progress shows that we can and must obtain 100% of our energy from renewable sources. Let’s get it done. Sign here to make sure we’re on the right path. 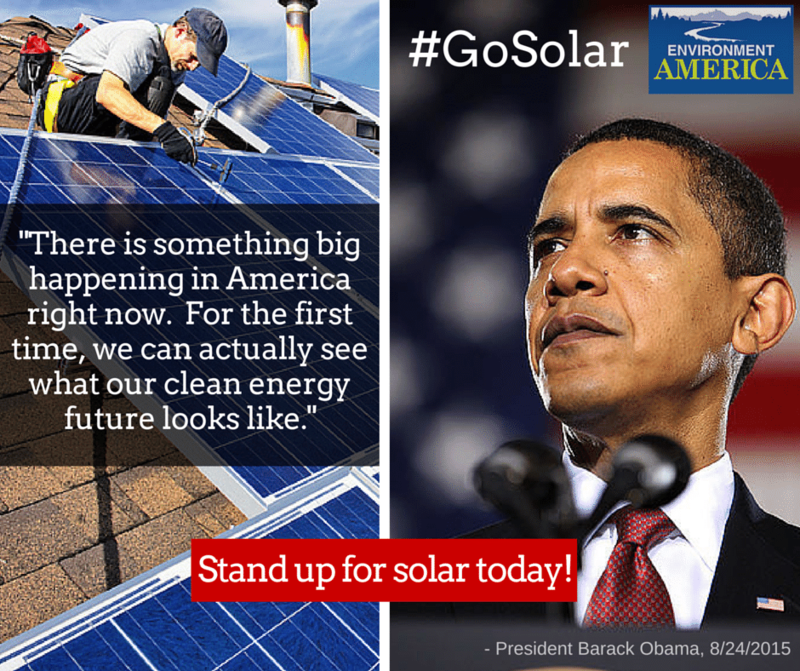 Learn more about the President Obama’s solar plan here! Sign to stand up for solar and wind today!